The Betrayal (Bartsch 595 iii/iii). 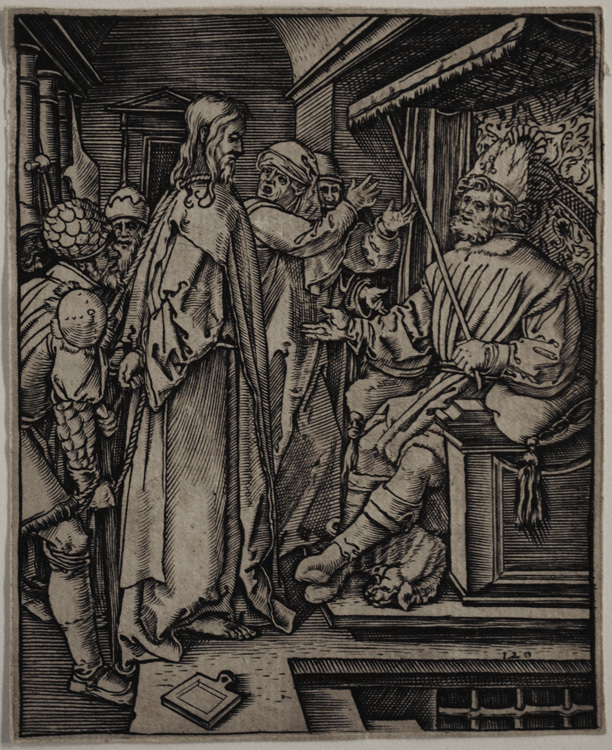 Engraving after Dürer's Small Woodcut Passion, c. 1512. Good impression on laid paper with thread margins. "11" in Cartouche, "12" lower right. Small stain extending from the bottom right into the high priest's servant's forehead. Image size: 125x99mm. Price: $1850. Jesus before Annas (Bartsch 596 ii/iii). 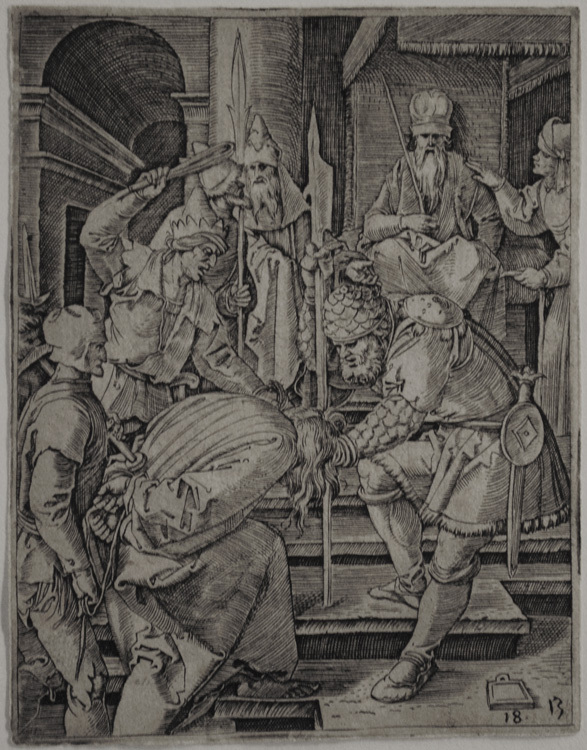 Engraving after Dürer's Small Woodcut Passion, c. 1512. Very good impression on laid paper with thread margins. Cartouche empty, numbered "13" at bottom of print. Image size: 15x98mm. Price: $2000. Jesus before Caiphas (Bartsch 597 ii/iii). 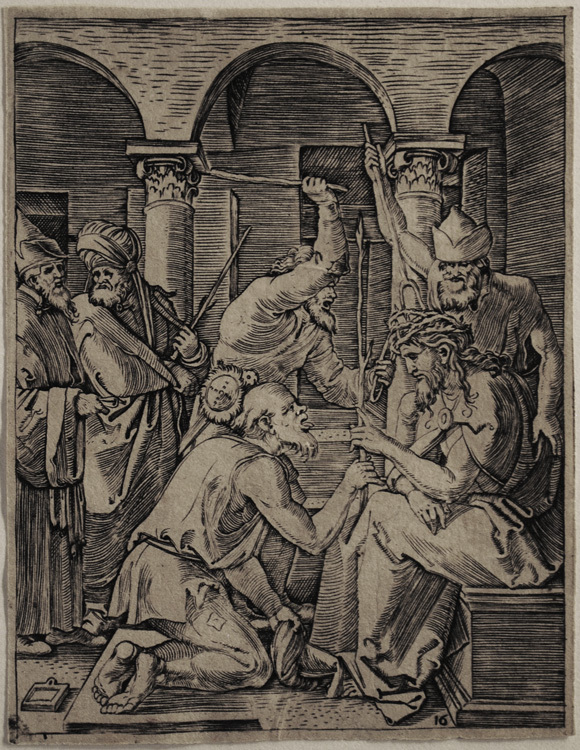 Engraving after Dürer's Small Woodcut Passion, c. 1512. Good impression on laid paper trimmed on or within platemark; small stains on near guard's right sleeve and far guard's elbow. Cartouche empty, numbered "13" at bottom of print. Image size: 126x100mm. Price: $2000. Christ mocked (Bartsch 598 ii/iii). 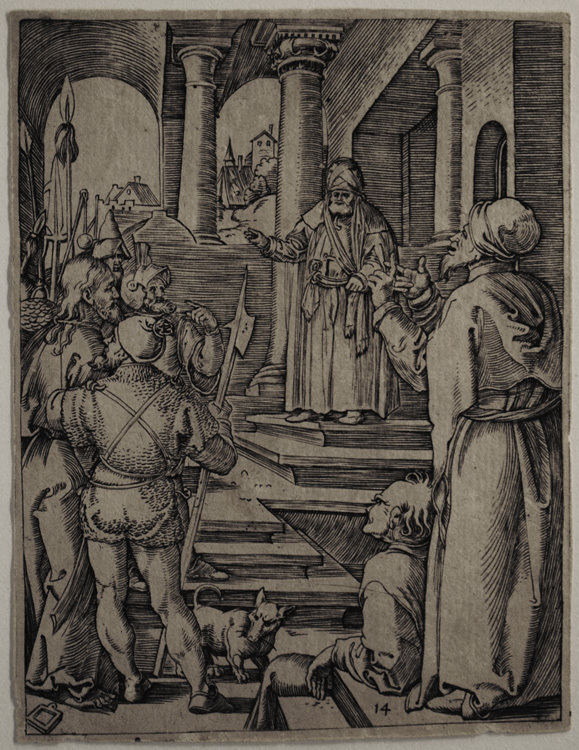 Engraving after Dürer's Small Woodcut Passion, c. 1512. Good impression on laid paper with thread margins. Cartouche empty, numbered "17" at bottom of print. Image size: 126x100mm. Price: $2000. Jesus before Pilate (Bartsch 599 ii/iii). 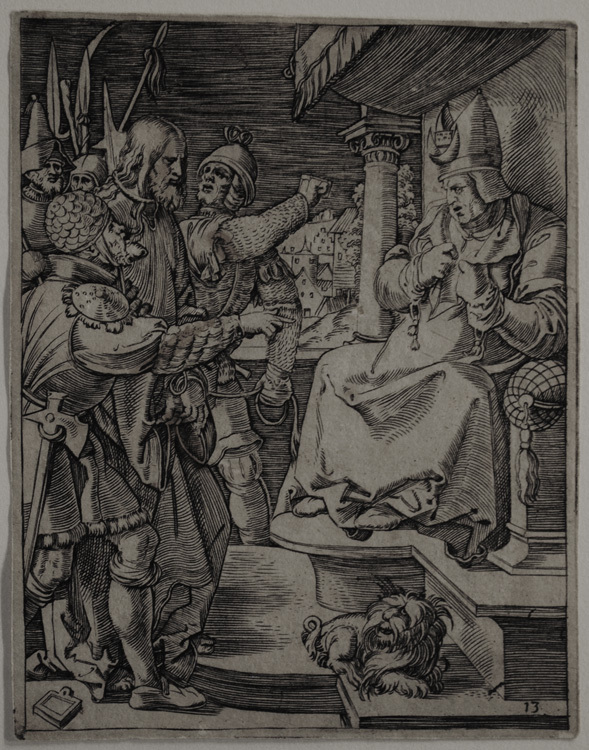 Engraving after Dürer's Small Woodcut Passion, c. 1512. Good impression on laid paper with thread margins. Cartouche empty, numbered "14" at bottom of print. Image size: 129x98mm. Price: $2000. Jesus before Herod (Bartsch 600 ii/iii). 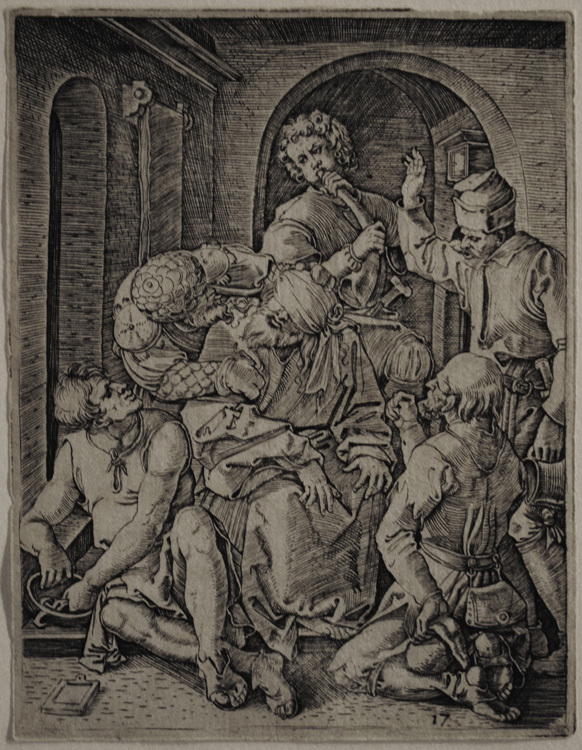 Engraving after Dürer's Small Woodcut Passion, c. 1512. Good impression on laid paper with thread margins. Cartouche empty, numbered "12" at bottom of print. Image size: 124x101mm. Price: $2000. The Flagellation (Bartsch 601 ii/iii). 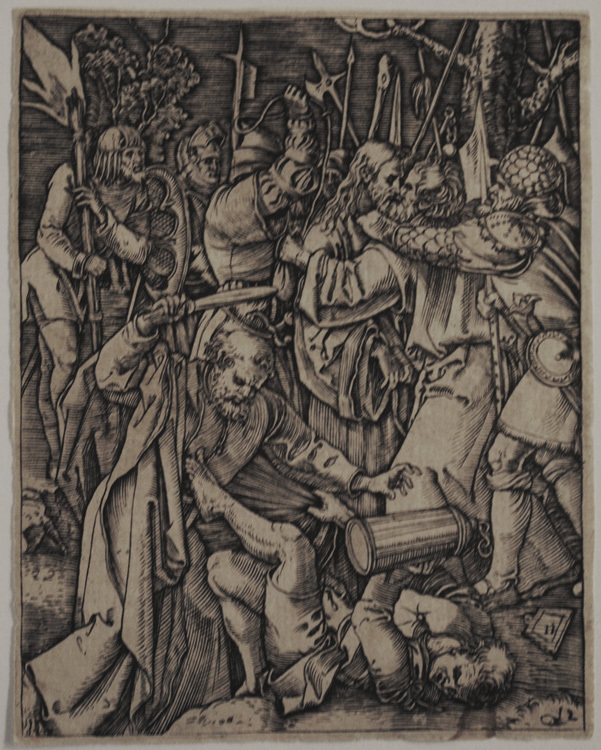 Engraving after Dürer's Small Woodcut Passion, c. 1512. Good impression on laid paper with thread margins. Cartouche empty, numbered "15" at bottom of print. Image size: 127x100mm. Price: $2000. Jesus crowned with thorns (Bartsch 602 iii/iii). 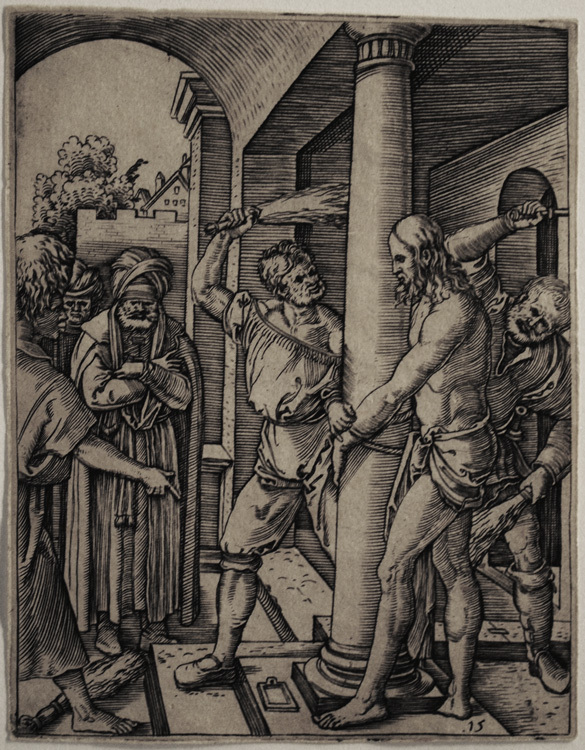 Engraving after Dürer's Small Woodcut Passion, c. 1512. Good impression on laid paper trimmed on or within platemark. Cartouche empty, "16" lower right. Image size: 127x98mm. Price: $2000. Ecce Homo (Bartsch 603 iii/iii). 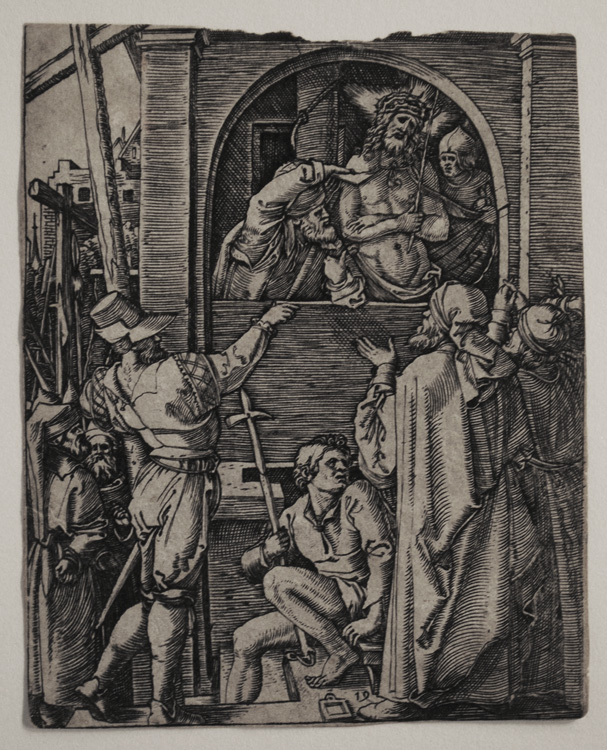 Engraving after Dürer's Small Woodcut Passion, c. 1512. Good impression on laid paper trimmed irregularly at top and within the platemark on the sides and bottom. Cartouche empty, "19" lower right. Image size: 123x98mm. Price: $1500.